Based on a 2010 novel by Peter Bognanni, 2018’s The House of Tomorrow introduces us to 16-year-old Sebastian Prendergast (Asa Butterfield). He lives a highly sheltered life with his grandmother Josephine (Ellen Burstyn) in an outdated tourist attraction known as “The House of Tomorrow”. When a youth group visits the House, Sebastian meets Jared Whitcomb (Alex Wolff), a young rock musician who deals with the impact of a heart problem. Sebastian works through this relationship and its impact on his future. That makes House sound like any of a million “coming of age” stories, and there’s a reason for that: it follows the template pretty closely. Sure, it goes down a quirky “indie” path but it still chases the theme in a largely predictable manner. In particular, the characters hang onto these notions in a heavy manner. Sebastian offers a borderline stereotypical “sheltered nerd who comes out of his shell” while Jared provides the usual hard-edged influence that facilitates these changes. Throw in the sick kid who’ll probably die young and House should be a trite dud. Happily, it largely manages to overcome its limitations to become an engaging drama. The actors carry much of the load, and Wolff fares best of all. I can’t claim he turns Jared into anything unique, but he adds an edge to a role that could turn both mawkish and annoying to bring life to the proceedings. As Sebastian, Butterfield finds himself with a character similar to the role he played in The Space Between Us. There he took on a boy born on Mars who tried to adjust to life on Earth. Though Sebastian spent his time in Minnesota, Butterfield brings the same sense of “alien visitor”, a choice that could potentially backfire – and occasionally does. Butterfield can feel awfully precious and his Sebastian threatens to turn into a cartoon. He doesn’t, though, and Butterfield manages to churn out a fairly solid performance. Throw in strong supporting turns for pros Ellen Burstyn and Nick Offerman and the actors give the film a good boost. The rest of House feels less endearing, as it really does follow some trite paths. I can’t claim the story manages anything new or special as it goes. Nonetheless, I don’t really care. The actors bring enough warmth and charm to House that it succeeds in spite of its weaknesses. The House of Tomorrow appears in an aspect ratio of approximately 1.85:1 on this Blu-ray Disc. This was a fairly good image. For the most part, sharpness satisfied. Occasional wide shots tended to be a bit iffy, but the majority of the flick demonstrated strong delineation and clarity. I noticed no shimmering, jaggies or edge enhancement. The image remained clean and lacked any source defects. Colors felt subdued. The movie preferred a somewhat amber and teal feel and lacked many instances of vibrant hues, though the tones seemed fine within those stylistic choices. Blacks were dark and tight, while shadows showed appropriate clarity. Overall, this was a positive presentation. As for the DTS-HD MA 5.1 soundtrack of House, it offered a low-key auditory experience. Sound quality was always good, at least. Music worked the best, as the score and songs demonstrated nice range and depth. Effects didn’t play a major role, but they seemed acceptably clear and accurate, while speech was distinctive and natural. The soundscape lacked much to impress. Music dominated, as songs/score came from all around the spectrum. Effects had less to do, as they focused the realm of general environment. Still, the track did what it needed to do for a film of this sort. 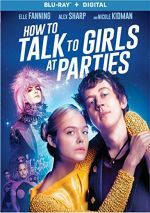 As we move to extras, we find an audio commentary from writer/director Peter Livolsi and actors Asa Butterfield, Maude Apatow and Alex Wolff. All four sit together for a running, screen-specific look at story/characters, cast and performances, music, editing, sets and locations. Of the four participants, we hear the most from Livolsi and Wolff. Butterfield chimes in a decent amount, whereas Apatow barely pops up at all. Despite the imbalance, this becomes a decent commentary. We never get a particularly deep chat, but it goes into a good variety of topics and winds up as a reasonably engaging piece. Next we get Ellen Burstyn In Conversation, a 36-minute, six second chat between the actor and Livolsi. They discuss how Burstyn came to the film and her relationship with Buckminster Fuller, her performance and their collaboration, visual choices, and related domains. We don’t get a lot about House itself, but we do find a nice collection of thoughts from Burstyn about her life and career. In addition to the trailer, we visit the movie’s NYC Premiere Q&A. It lasts 29 minutes, 45 seconds and features Livolsi, Burstyn, Butterfield, Wolff, and Apatow. “Q&A” examines the source novel and its adaptation/path to the screen, cast, characters and performances, music, and related topics. This becomes an engaging chat that touches on a good array of subjects. 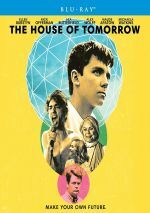 One of a skillion “coming of age” stories, The House of Tomorrow lacks much that allows it to stands out from that crowded field. However, its cast manages to lend depth to the proceedings, so they make it an enjoyable journey. The Blu-ray brings us very good picture along with adequate audio and a few useful supplements. Though House may not dazzle, it turns into an interesting enough character piece.